Access Profiles, Inc.: How to Hire “Fresh” Talent without a Long Term Commitment! 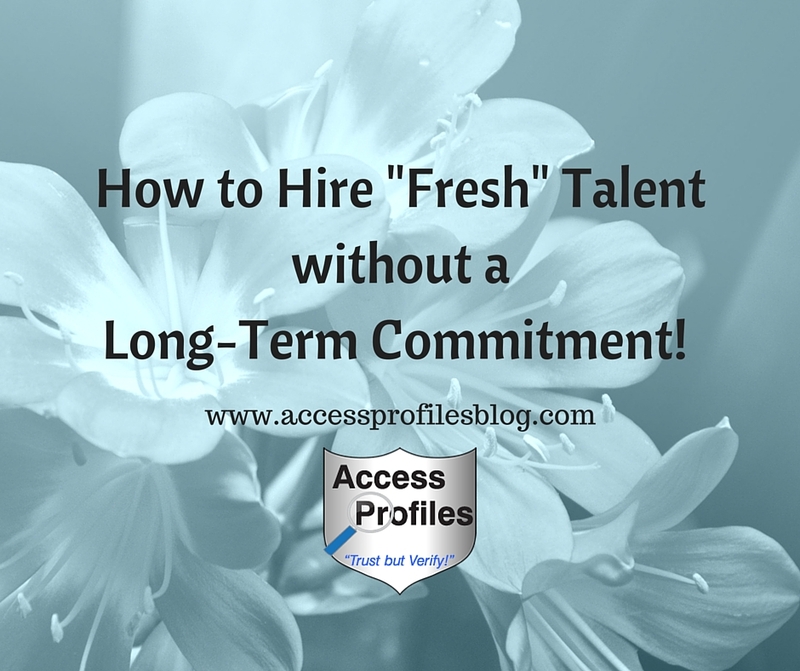 How to Hire “Fresh” Talent without a Long Term Commitment! If your company is in need of help, but you are not ready to make a permanent hire, consider Hiring Interns or Temps! Both can inject some new energy into your business and ease the work load on your existing employees. Temps & Interns ~ Perfect Way to Inject Fresh Talent into Your Small Business! "Tweet This"! But as with anything there are definite “pros” and “cons” to hiring both interns and temp workers. Increase Company Productivity Without a Large Dent in Your Budget - Hiring interns is relatively low-cost. It can also help you meet peak or seasonal needs without a long-term commitment. Provide A Different, “Younger”, Perspective - Interns can bring enthusiasm and eagerness to your company. They come with a “young” and fresh mindset that can re-energize your operations. Practice “Paying it Forward” - Interns provide an opportunity for promising employees to develop their supervisory skills. It allows them to take on a “mentor” role and gain valuable experience in leadership skills. Establish a Possible Link to a Future Hire - An intern will become fully trained to the operations and culture of your company. This will make them significantly more qualified for a future open position than the majority of candidates who may apply. The Time Required to Bring them “up to speed” - In some instances, interns may be unable to jump right in where needed. A certain amount of training in your company procedures and goals will be necessary. This can create a burden on existing employees. Limited Experience - Interns typically have little “real work” experience and are unfamiliar with an office environment. They also have less past business information from which to draw. Hiring Temporary Workers can also be a great option for a business needing additional help. 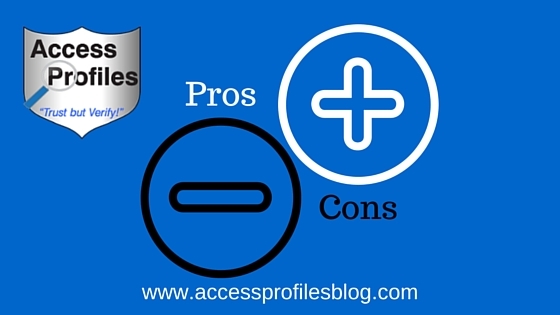 Choosing to hire temps also brings its own set of pros and cons. Eliminates the Need to Provide Training and Benefits - The costs associated with hiring an in-house employee is always higher than the cost of an outside Temp Worker. This is the main reason most businesses opt to hire temps for “non-core” functions. Lessens the Workload on Existing Employees - Temp workers free them to concentrate on other, possibly more important, projects. Provides Your Company with an “Expert” in a Specific Field - Many Temporary service providers build up their “inventory” with workers having specialized skills. By hiring a temp agency, your company has access to those talents. Allows You More Flexibility - Your employ of a temp worker is often “at will” (based on your contract with the temp agency). It is generally much easer to replace or fire the temp employee than it is a traditional employee. Helps Your Business Adjust More Quickly to Market and Workload Fluctuations - It is possible to fill a needed position much more quickly than you can ever do when hiring a long-term employee. Lack of Company Knowledge - An in-house employee will always have a better understanding of the “ins and outs” of a position and of your company. Less “Loyalty” or Commitment to Your Company - No temporary employee will have the same vested interest in your company as a full-time employee. The feeling of being in it as a “team” is harder to create. Despite the possible problems of hiring interns and temporary employees, I believe the “pros” outweigh the “cons”. And if you have decided that hiring an intern or temp is for you, these tips will help you find the quality hires you need. A great way to find quality interns is to form a relationship with local universities and trade schools. Contact their placement office, department heads, or grad school program. Do this in advance of ever needing your first intern. The better you cultivate this relationship, the more likely you are to get quality interns when the time comes. You can also use this method for finding a good temp agency. Make sure to be clear with the agency about the skills and type of worker you will be looking for. The more concise you are, the more likely the agency will be to refer someone that will be a good fit. It is also possible to find companies and individuals to fill your needs through social media groups and connections. Look for people you find yourself seeking advice from or who offer quality information in your groups. These are your “go to” people and can make for a great source. Just make sure to screen these hires as you would any full-time employee (read my latest blog article on this subject here). Over the course of owning a business, it is possible to experience many fluctuations in market demand and personnel needs. Being prepared and willing to hire interns or short-term employees can help you meet them and even flourish. What have you got to lose? After all, it is only “temporary”! For more information on Hiring for Your Business, visit our Background Investigations page. And be sure to Contact Us Now for a Free Consultation! Excellent article, Kim. I have often thought of hiring interns and this article reminded me of the benefits, both to my business and the to interns. Thanks! I am happy that you liked my article Diane. I personally was an intern my last year of college and my daughter was an intern in grad school (which led to her current full-time position!). I think, as you pointed out, that it is a mutually beneficial arrangement! Thanks again for taking the time to read my post and comment. As always, it is very much appreciated! I have hired interns several times and have had great experiences. Most have been reliable and have added a fresh dimension to the work they performed. One con is that sometimes they aren't as committed and can let other priorities get in the way, but that didn't happen too often. Thanks for posting and sharing your perspectives. Thank you for your personal insight on this Sheryl, and I am happy that your experience with interns has been a positive one. I really believe that "fresh dimension" you mentioned is a valuable resource many don't recognize. As far as the commitment issue, that is really hard to get from someone who is only there temporarily. However, I do believe that most interns and temps genuinely want to do a good job and contribute, so I am glad to hear that this really was never a big problem for you. I also appreciate you taking the time to read and comment on my blog! Very good points Gerry! Both ethically and legally, interns should not be used as "unpaid labor". It is important that they receive compensation, either in the form of wages or academic credit (both of which reward the intern monetarily for their services). Thank you for taking the time to leave such an important comment!